A few years ago, whoopie pies made a come back. I absolute love them and was so excited to see them in more bakeries. I even bought myself a whoopie pie pan to make them at home! My other love: Texas style sheet cake. I broke out my pan the other day and decided to combine them and make Texas sheet cake whoopie pies. 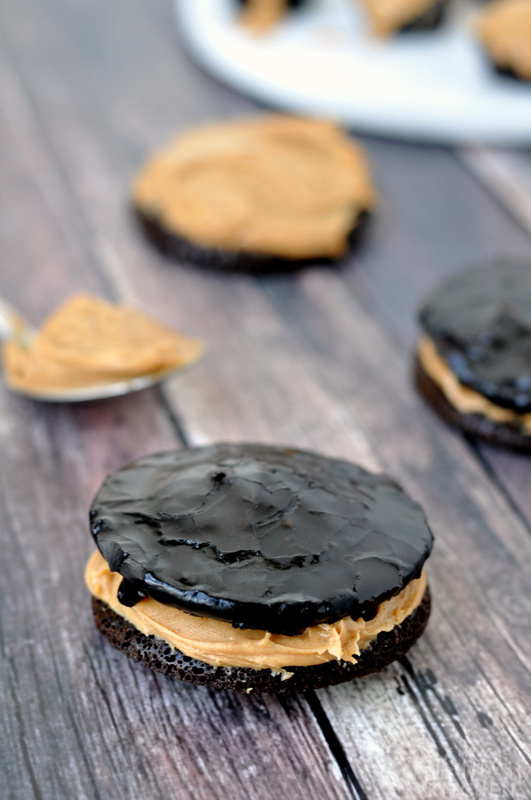 When trying to decide what to put in my whoopie pies, I went back and forth between peanut butter and cookie butter. In the end, I settled on peanut butter but I definitely plan to remake them and try cookie butter too. I think both are amazing. 1. Preheat oven to 350 degrees. Lightly spray a whoopie pie pan with nonstick cooking spray. Set aside. 2. In a large mixing bowl, combine flour, sugar and salt. 3. Melt butter in a saucepan over medium heat. Stir in 2 Tbsp cocoa powder and mix well. Add boiling water and let boil for 30 seconds to one minute. Remove from heat and add to flour mixture in bowl. 4. In a small bowl, combine buttermilk and egg. Mix in baking soda and vanilla extract. Stir in to flour mixture and mix until combine. Divide between sections in whoopie pie pan. Bake for 10 – 15 minutes or until set. 5. Meanwhile, melt butter for frosting in a saucepan over medium heat. Add 2 Tbsp cocoa powder and, once mixed well, remove from heat. Add milk, vanilla extract and powdered sugar. Mix well. Pour over warm whoopie pies and let set. 6. Once frosting has set. 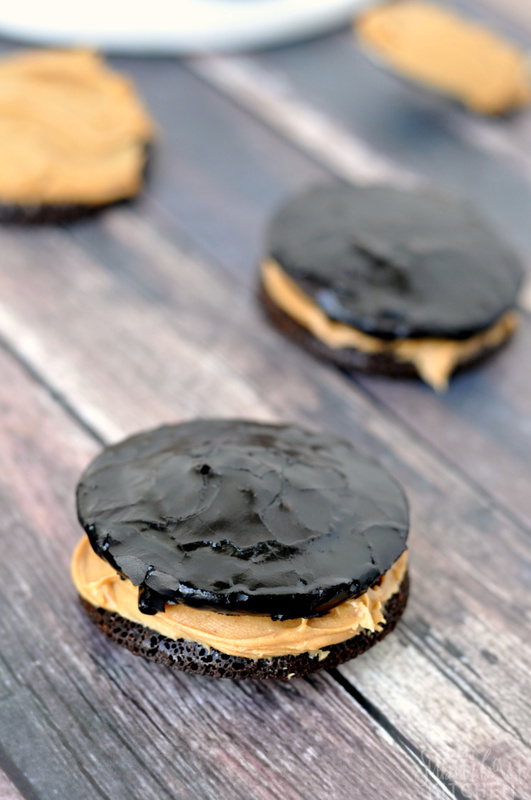 Divide peanut butter between half of the whoopie pies. Top with the remaining whoopie pies. If you’ve ever had Texas sheet cake, you know the frosting is the best part so I poured it over both pieces of the whoopie pies. You could easily just do the top of pies instead if you wanted though. Have you ever made whoopie pies at home? What is your favorite flavor combination? Preheat oven to 350 degrees. Lightly spray a whoopie pie pan with nonstick cooking spray. Set aside. In a large mixing bowl, combine flour, sugar and salt. Melt butter in a saucepan over medium heat. Stir in 2 Tbsp cocoa powder and mix well. Add boiling water and let boil for 30 seconds to one minute. Remove from heat and add to flour mixture in bowl. In a small bowl, combine buttermilk and egg. Mix in baking soda and vanilla extract. Stir in to flour mixture and mix until combine. Divide between sections in whoopie pie pan. Bake for 10 - 15 minutes or until set. Meanwhile, melt butter for frosting in a saucepan over medium heat. Add 2 Tbsp cocoa powder and, once mixed well, remove from heat. Add milk, vanilla extract and powdered sugar. Mix well. Pour over warm whoopie pies and let set. Once frosting has set. 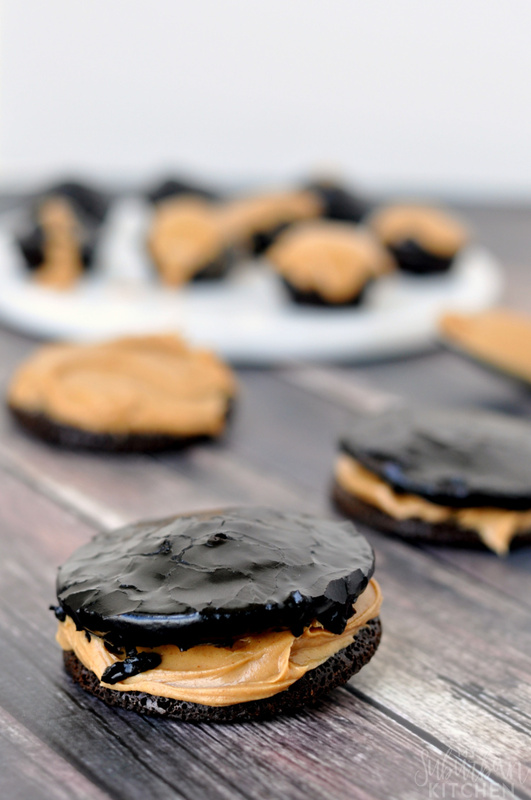 Divide peanut butter between half of the whoopie pies. Top with the remaining whoopie pies. Wow, these look rich! Nice combo for the chocolate/peanut butter lovers! Thanks for sharing it with us at Family Joy Blog linkup. These look so yummy. Thanks for sharing at Over The Moon Party. Hope you come back next week so I can stop by again. I hope you will also share at Thursday Favorite Things this week. Stopping by from Thrifty Thursdays linkup. These look absolutely delicious!! Will have to try. 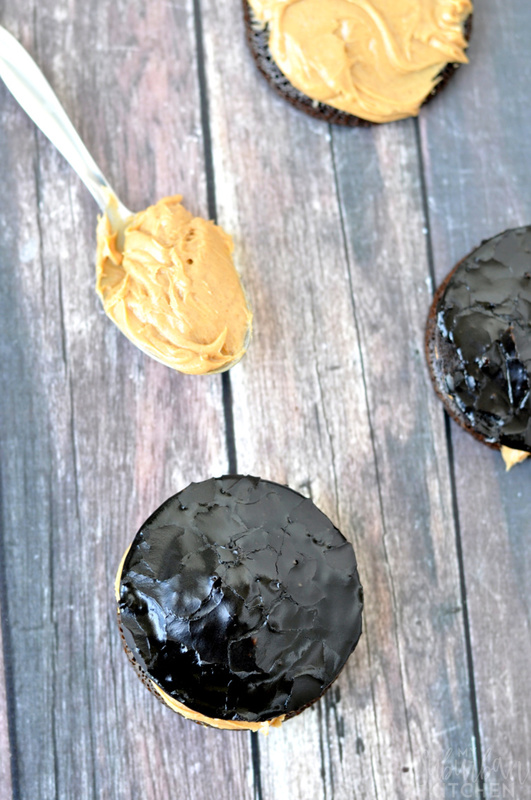 I am not a huge fan of peanut butter, but these just sound so good! I’ll be waiting the cookie butter version, too. 😀 Thanks for sharing at Fiesta Friday #164! What a great idea a Texas Sheet Cake Whoopie Pies! Hope you have a fantastic weekend and thanks so much for sharing with us at Full Plate Thursday. Love that peanut butter filling. Thank you for sharing with us at the Merry Monday party! We always look forward to your creativity. These looks so delicious! I have a feeling I could not eat just one! Looks yummy. Thanks for sharing at the Inspiration Spotlight party. Pinned & shared.